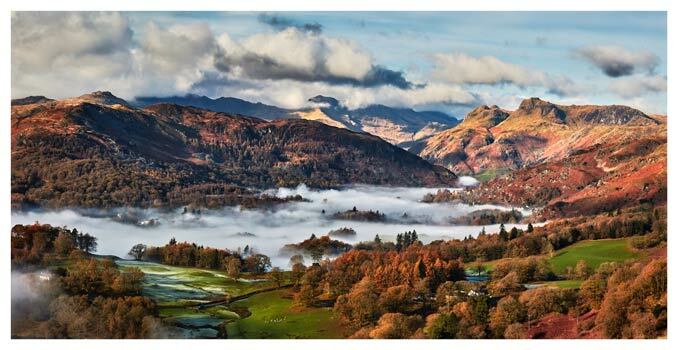 Prints of the Langdale Valley and surrounding fells and mountains in the Lake District. The Langdale Valley is in the centre of the Lake District to the West of Ambleside. The route through Great Langdale, up past Blea Tarn and down into Little Langdale is an absolute classic with wonderful views in all directions. The view over Blea Tarn towards the Langdale Pikes is a classic Lake District scene. The trees around Blea Tarn look great in Autumn and the Pikes look wonderful in the Winter. Generally Blea Tarn is a photography hot spot all year round. Fine art prints from around Langdale in the Lake District, UK. Prints on world class Hahnemühle fine art paper.